In our February blog, we touched on how Power BI and Azure SQL Data Warehouse together provide customers with unmatched analytics capabilities that enable fast, interactive analysis across petabytes of data – we call it petabyte-scale analytics. Today we want to call attention to the exciting news that Azure SQL Data Warehouse has again outperformed other cloud providers in the most recent GigaOm benchmark report. The first GigaOm report, announced in February, focused on the TPC-H benchmark which uses more simple queries to measure performance. The report found that Analytics in Azure is up to 14x times faster and costs 94% less than other cloud providers. The most recent report, released today, focuses on the TPC-DS benchmark. The TPC-DS industry benchmark is particularly useful for organizations that run intense analytical workloads because it uses demanding queries that mimic real-world business functions to test performance. For instance, one of the queries used in the TPC-DS benchmark report calculates the number of orders, time window for the orders, and filters by state on non-returned orders shipped from a single warehouse. This type of complex query that spans across billions of rows and multiple tables could be used to triangulate pricing and sales data for companies in order to customize offers. In short, this is a real-world example that is best suited for a data warehouse. Power BI users can be confident in performing intensive, complex queries like this one by easily integrating with Azure SQL Data Warehouse to get fast, unmatched performance whenever they need it. Additionally, users get unmatched security and privacy as outlined in Donald Farmer’s new white paper, Everyone’s a Target. 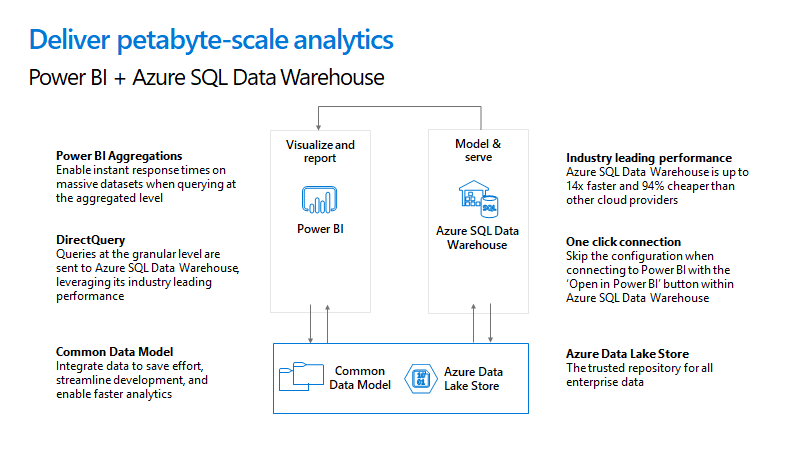 This is why customers are choosing Power BI with Azure SQL Data Warehouse to handle their most demanding data needs and deliver instant insights across their organizations. Power BI and Azure together deliver a complete and robust analytics solution. Learn more.